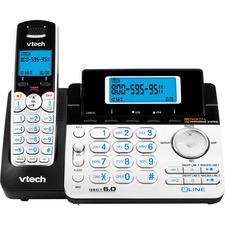 Expandable Cordless Phone System features two lines, dual Caller ID, digital answering system, and DECT 6.0 technology for the best sound quality, security and range in cordless phones. Interference-free technology delivers crystal-clear conversations that won't interfere with wireless networks and other electronic devices. Digital security protects you from identity theft. Your call is digitized and encrypted, making it nearly impossible for someone to eavesdrop. Phone system includes a handset and base and is expandable up to 12 handsets using only one phone jack. Dial and receive calls on two different phone lines with one phone. Dual Caller ID/call waiting stores 50 calls. Telephone also features a speakerphone in the base and handset, 50-name/number directory, keypad on base, any key answer, remote message retrieval, handset volume control, page/handset locator, selectable ring tones, and blue backlit keypad and screen.